Ted Hennessey focuses his practice on the efficient and creative resolution of complex public and close corporation merger and shareholder rights matters, along with health care, construction, real estate and other commercial disputes. He represents clients in the real estate development, construction contracting, investment banking, hedge and other investment fund management, and transportation industries. Ted has served as lead counsel in more than a dozen jury trials, as well as numerous matters tried to the bench or to arbitrators. He also regularly serves as lead counsel in cases before the North Carolina Business Court. In addition, Ted advises and represents clients in the negotiation of construction and other commercial contracts and corporate governance documents. 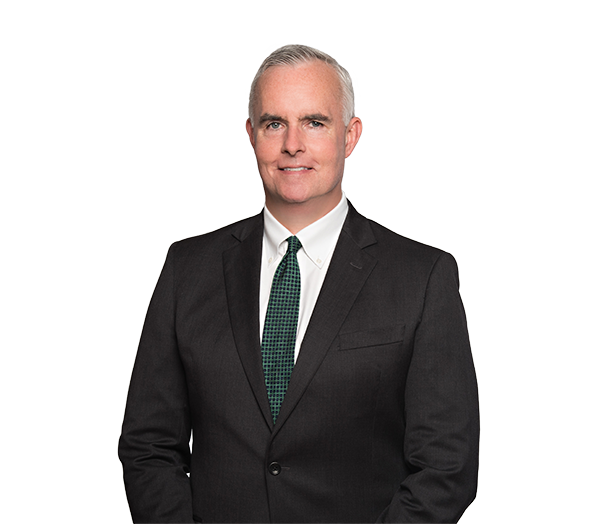 He heads teams conducting internal investigations and representing the targets of both state and federal investigations. Ted is a frequent speaker at seminars and meetings on trial and litigation practice and other issues regarding commercial dispute resolution. Represented multiple trust beneficiaries seeking to enforce a trust provision regarding the terms of sale of shares in a privately owned North Carolina railroad. The Court entered summary judgment requiring the trust to offer the shares for sale to beneficiaries on the terms sought by the firm's clients. Represented a private equity firm in multiple class actions challenging its effort to take private a publicly held North Carolina corporation. Represented the general partner in multiple real estate limited partnerships in a suit challenging its contractual right to deny "admission" as a limited partner to a hostile purchaser. The suit was successfully and creatively resolved to the satisfaction of our client. Represented the general partner/management entity of multiple real estate partnerships in a suit challenging its right to terminate a management relationship with the corporate assignee of a former general partner. Represented the successor by merger of a North Carolina firm sued both by a former employee and by the founder and majority shareholder of the merged entity, each alleging a variety of claims based on asserted rights in both the pre- and post-merger entities. Represents a major developer of continuing care retirement communities in a dispute over the construction cost overruns attributed to both the design and construction teams. Represented the developer of a condominium project buffeted simultaneously by the contractor's abandonment of the project and the onset of the Great Recession; navigated client through multiple challenges with the project lender, investors, prospective purchasers and multiple subcontractors and suppliers to the former contractor. Arbitration resolved to our client's satisfaction. Represented through summary judgment and appeal a construction owner, general contractor and first-tier subcontractor seeking dismissal of breach of contract and lien claims by a supplier. In a decision affirming a trial ruling in favor of the firm's clients, the Court of Appeals clarified a principle of construction lien procedure broadly in favor of construction owners and general contractors. Universal Mechanical, Inc. v. Hunt, 114 N.C. App. 484 (1994). Represented a defendant equipment supplier to a municipal water treatment project in multiparty federal court litigation with the public owner, where damages alleged on claims of design and construction error exceed $30 million. Represents in federal district court and in bankruptcy court real estate development entities seeking relief from numerous subcontractor and supplier liens resulting from performance and payment defaults by general construction contractors. Represented multifamily owner and management entities in litigation against the manufacturer and vendors of allegedly defective heating and air conditioning equipment. Represented the owner and developer of a luxury resort property of claims of construction cost overruns and delays alleged to have resulted from numerous errors and omissions in the design and construction administration processes. Represented and successfully mediated claims against a contractor and architect on behalf of a national logistics firm relating to environmental cleanup and other remedial costs following a release of diesel fuel and oil from a terminal facility. Represented a testamentary trust in an action seeking the removal and replacement of its trustee. The firm's client prevailed at all stages of the action, including before the North Carolina Court of Appeals and Supreme Court. In re Charnock, 158 N.C. App. 35 (2003), affirmed, 358 N.C. 523 (2004). Represented multiple university management entities in a challenge to hedge fund "gating" in the course of the Great Recession. Represented the lead private equity investor and a series of co-investors in litigation over post-closing indemnity and escrow/earnout claims by a publicly traded acquirer. Represents the private shareholder-seller in a dispute over EBITDA calculation for earnout purposes. Represents the private equity sponsor-seller in a series of disputes over post-closing indemnity claims and related earnout escrow entitlement. Represented at trial and on appeal a publicly traded entity as plaintiff on claims of commercial bribery. The case established as a matter of first impression in North Carolina that an employer is entitled to recover as damages the amount of commercial bribes paid to its employee, and that the bribe amount must be trebled under the North Carolina Unfair and Deceptive Trade Practices Act. Kewaunee Scientific Corp v. Pegram, 130 N.C. App. 576 (1998). Numerous successful representation before FINRA (formerly NASD) arbitration panels of mergers and acquisitions advisory firms in disputes regarding advisory fees and other contractual issues. Represented in several mediations and through trial a national trucking firm in defense of high-dollar brain injury and other claims following a collision between tractor-trailers.